Early on Sunday morning (Nov. 11), early risers will be treated to a beautiful array of a brilliant planet, a bright star and a lovely slender crescent moon. The trio will form an eye-catching isosceles triangle in the dawn twilight. The sky triangle will consist of Venus, the bluish star Spica in the constellation Virgo and a waning crescent moon, just 8-percent illuminated and only 2 1/2 days from new phase, as well as a total solar eclipse which will be visible over parts of Australia. Shortly after 4 a.m. local time, Venus and the moon will emerge side-by-side above the horizon, a little to the south (right) of due east. Venus will be about 6 degrees to the left of the slender moon; your clenched fist, held at arm’s length, measures roughly 10 degrees, so Venus and the moon will be separated by about half a fist. 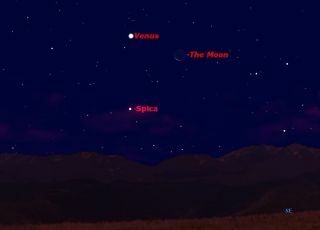 About an hour later, Spica twinkles low through the glow of dawn, 9 degrees below both Venus and the moon. Consider the isosceles triangle to be inverted; the base angles formed by Venus and the moon and the legs of the triangle extending downward toward Spica which marks the vertex angle. Venus is now several months past greatest elongation and is retreating around the far side of the sun, so a telescope will show it gibbous and small. After its brief moonlight tryst with our natural satellite on Sunday morning, naked eye observers will enjoy watching Venus go by Spica during the following week. On the mornings of Nov. 16 through Nov. 19 Venus is only 4 degrees from Spica, passing to its north. Of course, Venus will be far more brilliant than Spica, outshining that star by nearly 100-fold. And here too will be a fine finish to those who are conducting early morning vigils for the Leonid meteor shower, which will peak on Saturday, Nov. 17. In the weeks to come, Venus will continue to get progressively lower in the morning sky. It will still be fairly prominent through the end of this year, but will rapidly fall into the sunrise light by the end of January or early February. So enjoy Venus now while it still blazes in our early morning sky. Editor's note: If you and snap an amazing photo of Venus, Spica and the moon and would like to share it for a possible story or image gallery, send images, comments and location information to managing editor Tariq Malik at tmalik@space.com.